James Jones and Sons (Pallets & Packaging) has today announced the acquisition of one of the UK’s leading pallet collar manufactures, Billington International, for an undisclosed sum. The deal will see James Jones and Sons take immediate control of the Billington Group, with business operations continuing from Billington’s current office and warehouse premises in Rotherham, Yorkshire, to ensure a smooth transition for the Group’s long standing and loyal customer base and staff. The acquisition has been made to further expand the James Jones & Sons (Pallet & Packaging) range of products and services, which includes new pallets, pallet repair, pallet management, recycled pallets and bespoke packaging solutions, and to strengthen its market position in the pallet and packaging sector. 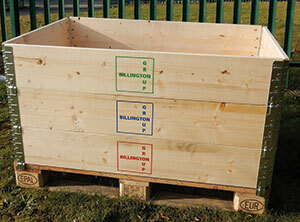 Wooden pallet collars help prevent spillage and damage, ensuring that irregular items are secured during transit. Collars are collapsible, stackable and space saving with sides that adjust gradually as products are placed inside, eliminating the need to bend over high bin sides. All new pallet collars are heat treated to meet ISPM 15 regulations and collars can be branded with company names and logos. This entry was posted in News and tagged handling & storage. Bookmark the permalink. ← Waste rubber! Waste plastics!